How do I synchronize my Humanity schedule with my Google Calendar? Go to the tab ShiftPlanning and click downward arrow icon beside publish button. 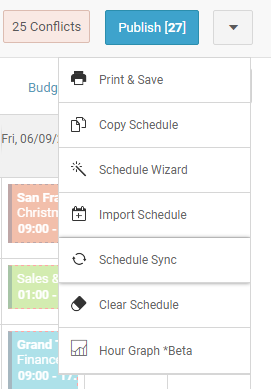 Select Schedule Syncfrom the drop-down menu. Click on the sync icon next to the position name from the left sidebar. Clicking on that will bring up your unique Calendar Sync URL. Copy the schedule sync URL that you want and Setup your calendar client. 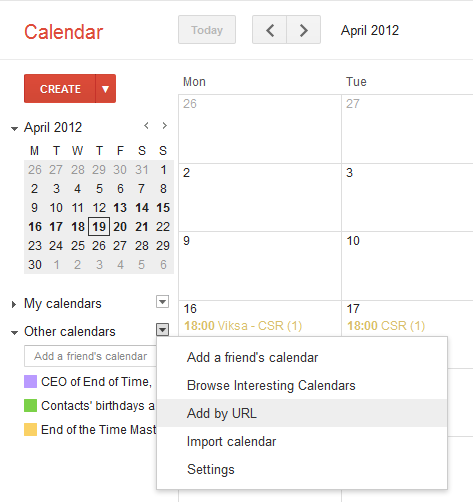 Once you have your Calendar URL, you need to configure that within your Google Calendar. How often does calendar sync update? Calendar applications typically fetch the Humanity schedule on a regular interval. Each calendar client has different options for how often they will re-fetch the calendar (from a few minutes to hours) while some clients such as Google Calendar, does not allow for users to select the frequency. When you first set up 'Schedule Sync' with Google Calendar, it will fetch your schedule as it sits currently. Google will continue to pull your data from Humanity but we are uninformed as to what interval it takes place.